I'm doing my final recorder concert ....... You will hear a varied program with music from 1600‘s, Vivaldi, Handel, a piece written by the recorder professor from McGill that I've been studying with (Matthias Maute) and even a bit of jazz! ​early 1600s by Giovanni Paolo Cima and Dario Castello. In addition to this delicious recorder dessert, you get a full meal of music from talented young King’s University music students performing on various other instruments as part of "Noontunes". ..part of The King's University "Noontunes" student concert series. The event is free and open to the general public. for a second Friday in a row! Dorothy Beyer will play one of the big sonatas in the recorder repertoire, "Il pastor fido” by Nicolas Chédeville (originally attributed to Vivaldi), together with Judy Loewen on harpsichord. Matthias Maute’s Sonata No. 2.
by King’s University music students. Dorothy is completing a Performance Certificate in Recorder at The King's University with Matthias Maute via Skype lessons. Maute’s Sonata No. 2 was written in the 1990s in a baroque style, but with Matthias’ unique fingerprint. The ERS is not participating at the Legislature Building this year. varied music performance that spread peace among the residents. ​where I am having my lessons on Skype with professors in Montreal. and also a surprising piece from the 1968 with interesting staging. As well, I will have an amazing dancer for one of the pieces. hear Judy Loewen’s wonderful playing on the harpsichord and the organ. something that you would have the capability of playing in the future. We will be playing solo music for recorder, oboe and cello by Van Eyck, Castello, Handel, Fiore, and Gabrielli. Sonata in e minor by Telemann. of McDougall United Church and run from approximately 12:10 to 12:50 p.m. This is a bring-your-lunch event. Coffee and tea are available. the Music Performance Trust Fund, and McDougall United Church. Named after the flame-haired Venetian priest Antonio Vivaldi, British baroque instrumental group Red Priest is the only early music group in the world to have been compared in the press to the Rolling Stones, Jackson Pollock, the Marx Brothers, Spike Jones, and Cirque du Soleil. This extraordinary acoustic foursome has been described by music critics as "visionary and heretical" and "outrageous yet compulsive", with a "break-all-rules, rock-chamber concert approach to early music." Red Priest performs Gypsy Baroque Fantasy, a program inspired by the expressivity and virtuosity of forgotten Roma musicians. Featured works are by Handel, Vivaldi, Telemann, Biber, Campra, Byrd, Nicholson, and Mielczewski. Teri Hron is back in her home town, our town! She is a professional recorder player and has led many workshops for the ERS. This tour is reserved for her performance with pianist, Zuzana Simerdova. - in concert with Edmonton's professional choir. Our Canadian Connections series is in its sixth incarnation. When our Artistic Director Michael Zaugg began his tenure, he introduced us to an eclectic array of fascinating new works including The Nightingale, a stand-out composition by Grammy nominated Uģis Prauliņš. This virtuoso work for recorder quartet and 20 part choir will be the highlight of the program. Our guest is Flute Alors!, the only professional recorder quartet in Canada. This unique combination of instruments and voices has inspired new Canadian works which will also be featured on the program. at All Saints' Anglican Cathedral. On April 24, 2016, our members, Donna Mae, Margriet, Lori, Dorothy and Vince premiered a piece at the Cosmopolitan Music Society's concert. Theme of the concert was Folk Music. The piece, written by Vince Kelly and titled Pirate Overture, includes a secret melody, which listeners were challenged to identify. The prize was a CD by Maurice Steiger, international professional recorder player. Further pieces were played by society members and friends Donna Mae, Lori, Alena (guitar) and Frances (bass viol). Saturday, March 18, 2017 2 p.m.
Read about Sylvia here and here. Edmonton has a lively professional music scene, and from time to time a recorder player or early music ensemble will grace one of the local stages. We try to provide links to these concerts. If you know of an upcoming event and think it should be posted here, please contact us. 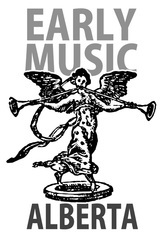 The Edmonton Recorder Society is an Institutional Member of ﻿Early Music Alberta;﻿ this entitles ERS members to a 50% discount for individual memberships. (In 2016, that means $25 instead of $50.) In turn, individual members are entitled to discounted concert prices. all are welcome for a morning of playing. Interested auditors welcome also. The 3 day festival is dedicated to the historically informed performance of music written before ca. 1850 and are all performed on period instruments.